The stock has been trading in range for long period of 5 years. Stock has tried to break out of strong resistance near 89 in July 14 and July 16 but could not succeed. 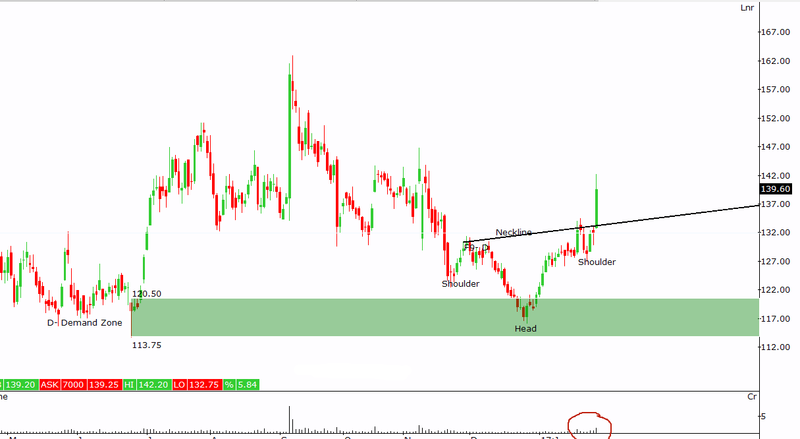 In the process the stock has formed pattern known as Rounding Bottom. A breakout of rounding bottom can give good targets. 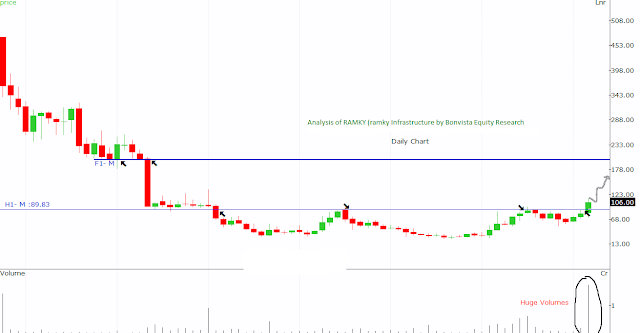 You can see on the monthly chart below the stock has moved up with good volumes and currently trading near 106. This move has come up with huge volumes. The stock can double from current level in an year or so. We are conducting a 2 day off-line training on Equity Analysis using Technical Charts. This is for investors / trades who wish to learn Classical Charting techniques. For last 3-4 weeks we have been writing about the new bull run once Nifty closes beyond 8960. The much awaited penetration of Nifty in the new uncharted territory has begun on 14 March after the election results of UP were declared. On that day Nifty gaped up by almost 160 points. At the close of this week Nifty is trading near 9160. We can safely assume that a new run of upward momentum has started in Nifty. How to trade this momentum can be debatable. This is because Nifty has gaped up and is still trading near all time high without the gap being filled up. We can expect this gap to be filled up sooner or later. There is a good amount of open interest increase in Call Options for strike price of 9200. It means that call writers are not willing to let Nifty go beyond this point easily. Be patient, let Nifty correct. It has good support near 8990. That would be good level to enter long positions. Time Technoplast is a company manufacturing plastic products like Drums, Containers, Conipails, Petsheets etc. This analysis below is on weekly chart. 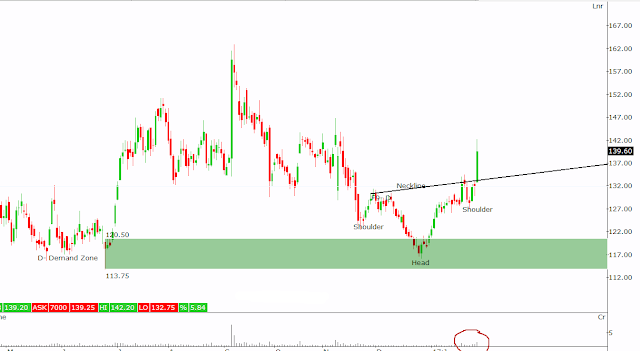 You can see that the stock was in consolidation phase since Sep 2016. This consolidation was in a broad range of 88 to 100. The consolidation has come after an expansion period which took the stock price from 49 to 100 in period of approximately 9 months. We know that the periods of expansion are followed by consolidation and so on. We can expect that the current period of consolidation is over and stock is ready for phase of expansion. We had recommended BHEL on breaking out of Head and Shoulder pattern on 30 Jan 17. Today the stock is trading at 165. Thats a gain of 19% since we recommended the stock. Bhel was trading in a downtrend on daily chart since Sep 16. Stock was trying to get into a new cycle of higher top higher bottom from its existing downtrend. For short term, the current Head & Shoulder breakout can act as confirmation to this theory. BPCL is trading near an attractive level. Current level is seen as a good support. Near this level the stock has also formed a double bottom-ish pattern which makes us believe that it is willing to gain momentum here on. On December 27 we had anticipated a breakout in Reliance Industries long term chart.& years long consolidation finally broke and Reliance Industries has begin its new journey. Have also reproduced the same article at the end of this post for your reference. Here is latest monthly chart of Reliance Industries. A frustrating consolidation continues in this large cap. This consolidation is referred to as Ascending Triangle. A breakout is expected after the consolidation. This time since this is an ascending triangle the breakout can be on upper side of the price. 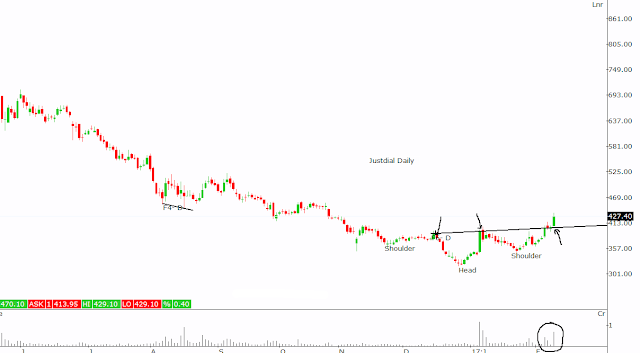 We had spotted Head and Shoulder Breakout in Justdial on 10 Feb 17 when it was trading at 427. Justdial has been in down trend since Jan 2015. The stock has been continuously witnessing a fall and the stock is down by whooping 75%. 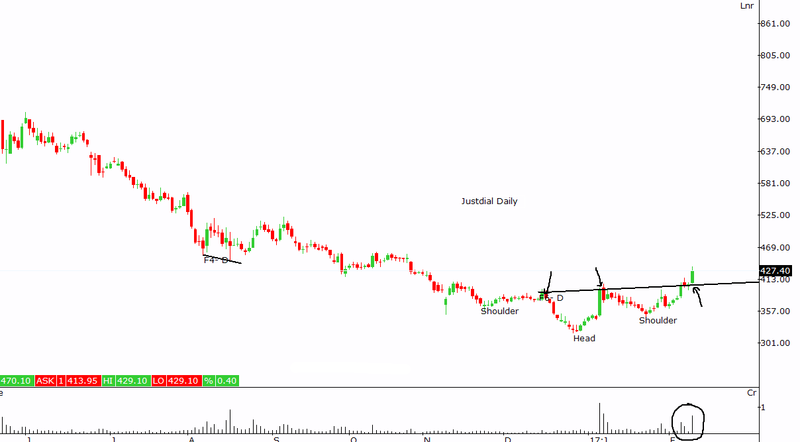 This head and shoulder breakout can be a start of short term uptrend in the stock. Had recommended Jubilant Foodworks on 18 Jan 17. The stock has gained 19.8% since then. Here is that article reproduced for you.